******** you dont mention the camera! you have to remove the camera before you proceed to the next step. I agree! It is very important to remove the front camera before proceeding past step 19. It's removal is reflected in the pictures used in subsequent steps! I edited the guide to reflect this, but my edit was rejected. I contacted iFixit about the missing step, and was told that enough people completed the guide without it, so it was deemed not necessary. Hi there. It seems this guide had a missing prerequisite, the front-facing camera. The removal of the front-facing camera has been added. We apologize for any inconvenience this might have caused. Thanks for letting us know. 1. the final attachment is held on vertically to a chassis wall. use a small flat object, perhaps your fingernail between the black foam and the vertical wall. it is a trick to pull the final piece off the wall without damaging the black foam. mine is now damaged and will not likely re-stick. it may not normally be a problem since your new piece may come with a rubber sticky thing. but in my case, i was removing a good one to replace a damaged one on my other phone. I thinks it's better to leave the earphone speaker attached until the power and sensor cable is removed from the phone. The speaker can then be carefully peeled off so that the foam and glue are retained on the speaker for reattachment to the new cable. I peeled it off with the cable in place as shown in the instructions and it tore the foam. I totally agree that it is better to leave the earphone speaker attached until the power and sensor cable is removed from the phone. It is too hard to see where to pry and not to pry and I also ended up tearing the black lining. The power button bracket has 2 screws that need to be removed, there's no mention of them in this tutorial. Agree with the above: Two screws holding the power button bracket are not mentioned and must be removed. One of them is very awkward to reach due to the digitiser and LCD cables being in the way. This was the trickiest part of the whole procedure for me. Otherwise a wonderful guide. Thanks so much. When removing and/or re-inserting the right-hand screw, I damaged the LCD cable and the phone did not work. Fortunately, the power/sensor cable was from a donor phone and I also was ale to use the display assembly from the donor phone as well to a good conclusion. Be very careful to fold the LCD and digitizer cables down out of the way when accessing that screw, or if you want ultimate protection, consider removing the display assembly before removing the power button. The instructions here should specify that the headphone jack is attached to a ribbon cable. And that said cable is *extremely* fragile. Same problem with tearing the headphone adapter ribbon. Didn't even notice it until I turned over the phone and the jack part fell out and hit the floor. No need to remove fully the headphone Jack..
to remove the power/sensor cable . 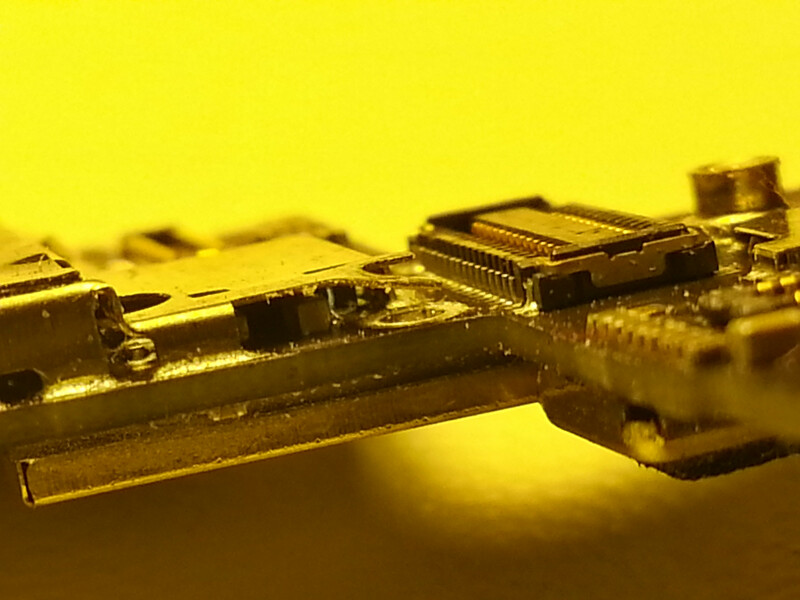 There is a small plastic 'box' covering a few components that must be transferred to the replacement cable assembly. Also, there is a small foam 'frame' that covers a sensor (proximity?) that must be transferred to the replacement cable assembly. I'm having constant problems with those cables. It came to the point that I took that cable out of my personal iphone and put it back and after that the proximity and light sensors don't work. And I tested 10 cables on 3 different phones and I can't get it to work. Do you have any idea what I may be doing wrong? The power button work, so it's just the sensors...and I really can't believe all my cables are bad because I had a good one, took it out, installed back and it stopped working. What can I be doing wrong during the installation? I had the same problem, grze, and after lots of frustration and trial/error I realized that the foam frame that Blarg referred to was this 0.5 cm plastic/rubber piece that was stuck on the original power and sensor cable. It's a rubber frame with a cool-looking reflective glass screen in the middle. If you transfer that onto the proximity sensor on your replacement cable (which doesn't come with it)... it should work perfectly. Is there a place where you can buy these foams that you put on the proximity sensor? When I remove these from the original one, they just don't stick anymore. Anyone have information regarding where to buy the proximity sensor filter, preferably in the USA? The guide just mentions a shroud but doesn't have a picture for it and now my proximity sensor isn't working during calls. After installing a new sensor cable, the proximity sensor was not working, but the sleep button and also the mic noise reductor too. Luckly I found the old cable in the trash and transplanted the square foam to the new one and got proximity sensor working again. My power button stopped working. Figured it was mechanical, since it didn't "click" anymore. got a new power/sensor cable, replaced it using this guide and now the proximity sensor is not working. I put all the rubber foams back in their places, made sure everything was stuck where supposed and it is still not working. If you are replacing yours, be very careful during this part! "Also be sure to transfer the proximity sensor shroud/filter adhered to the old power & sensor cable if your new one does not already come with one." It took me a while to figure out what they were referring to. Almost threw it out since it was stuck to the old flex! It's the little rectangular plastic piece with a little loop at the top left. You can see it in the middle of the power flex displayed in the previous step's picture. It seems it keeps the proximity sensor in place. It would be helpful if it were circled. There are two sensors on the power and sensor cable peeping through the front glass of the phone. Looking at the front of the phone, the sensor on the right is a square and dark one, whereas the sensor on the left is a round golden one. The square, dark sensor on the right needs to be covered with the proximity sensor UV filter foam sticker everybody is talking about. The sticky side needs to be applied directly to the sensor. You can get these stickers at eBay. Don't apply the sticker to the front display glass of your phone. Don't apply the sticker to the golden, round sensor. 501 andere personen hebben deze handleiding voltooid. Be careful in the step after removing the battery connector and then the battery, you forgot to mention the small springed contact piece below the batt connector, sharing the same screw. I dropped it on the floor after handling the batt but found it and figured out how to place it in the re-build. Anyhow, nice guide 1.5 hrs work wo to go on replacing the button circuit. 1. - printing the pages and taping the screws at step with scotch..
2. To avoid greasy hands problem, I used tweezers all the time .. I was in trouble with my Power button. I did it successfully however, I'm now facing an issue with the Sensor. It seems that something is wrong with my Sensor. I heard about a filter. Any thoughts? MAKE SURE YOU HAVE THE SENSOR FILTER TRANSFERRED!!! The guide does NOT make it explicit!!! Everything's ok except the proximity sensor. Not looking forward to take it apart again. The new cable may rip! Power button wouldn't click so I followed a different guide (very similar to this). I only realized now that proximity sensor wasn't working. It doesn't bother me too much, but I may try to fix it. I had to reopen it to fix my WiFi after a little piece fell out and I replaced it with aluminum foil. A small piece of plastic fell out that looks like the proximity sensor. How does it get affixed back to the power bracket? My main problem is that my pinhole microphone (next to the headphone jack for speaker phone and audio in videos) doesn't work anymore. It gives me a hissing sound. A guy at a fix-it store seemed to tell me that it was related to the power bracket and things might need to be shuffled around because it was very unlikely it was damaged. Does the little metal square on the power bracket provide power for the microphone? Is there anything specific that needs to be touching other parts in there to make it function properly? If you could respond to dannyjfong@gmail.com I would be very grateful. To Serge: it goes between the speaker and the top plastic part of the power cable. You can see it in step 29 first pict. Can you please explain this comment as i can only see 27 steps....? after the breaking of the switch power button I proceeded to replace the flat. After putting everything I have, however, found that the hands-free microphone is not functioning. I can not understand what could have gone wrong. I should add that the hands-free microphone with the old flat was working at 100%. I have already ordered a new flat, because maybe what I have mounted is defective ... I doubt it but I hope so! Does anyone have ideas or suggestions? Note on the screw template - Step 20 should be Step 22, and Step 22 should be Step 24. I also used Scotch Removable Double Sided Tape to hold the screws to the screw template page. Really did the job! I am repairing a power button that won't press down anymore. I have replaced the button but am still not able to push the button. Is this a sensor cable issue or is it something else completely? Verizon CDMA iPhone 4? You should review the iPhone 4S instructions (iPhone 4S Power and Sensor Cable Replacement), as I found some of the screws and components on my Verizon iPhone 4 to be more similar to the iPhone 4s (especially the cable cover and logic board connectors). Awesome guide- first time I ever cracked open an iPhone, and it was a total success! This guide is very good. I could replace the power/proximity sensor/mic cable successfully using this guide. Note that the two screws on the power button bracket should not be tightened all the way in - that jams the power button. I thightened them all the way and then loosened them (probably 270 deg anticlockwise) until the power button gave that distinct 'click' feeling when pressed. 1) When transferring the pads and spacer, it is possible to get by with reusing the original adhesive if you're very, very careful. I used a sharp single-edged razor blade to carefully lift between the adhesive (a double-sided tape) and the cable. A small X-Acto knife blade would probably work, too. As mentioned elsewhere, don't even think about using crazy glue, as the fumes will attack the various metal contacts in the phone and create a real mess. 2) Read all of the guide comments here before you start. There's a lot of great tips that will make things easier and save you from damaging parts. 3) I replaced my battery at the same time that I did the cable replacement, old battery was five years old and no extra labor since the battery comes out to do the cable replacement. I have a screw that isn’t wanting to come out. How do I fix the button without removing that one screw at the top? J’ai juste mis un peu de temps à comprendre que le support du bouton marche/arrêt devait passer derrière une languette en haut de la caméra frontale. Mais merci beaucoup pour ce tutoriel. J’ai remplacé la nappe et tout fonctionne parfaitement.